Building an online store is often considered to be a difficult, complex task. Using the combination of WordPress and the WooCommerce plugin, this is no longer the case. WooCommerce is the most popular e-commerce platform for WordPress and is being rapidly developed by WooThemes. It provides a strong e-commerce solution to set up your own online store in just a couple of hours. This easy and practical book will help you make the most of WooCommerce to be able to set up and run your online store yourself. 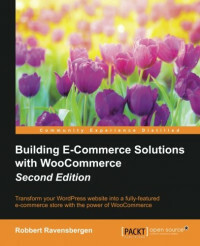 Installing WooCommerce is an easy task, but this book will explain in detail all the possible settings. After that you'll be adding products, different payment methods, and shipping solutions to your store. You will then customize your store by adding themes to change the look and feel. Once your store is running, you'll learn how to use discount coupons, process your orders, look at reports, and even expand the functionality further with additional plugins. By the end of the book, you will learn everything you need to add a fully functional online store to you WordPress website and start running an online business. Robbert Ravensbergen is an experienced e-commerce and IT manager. He has been working in several international roles for various companies. He's also a passionate writer and blogger. WordPress, WooCommerce, and Magento are the topics that he writes about. Robbert released several books about Magento and WooCommerce for Packt Publishing during the last couple of years. Besides this, he's an important writer in the Netherlands and well known for his understandable books for beginners about WordPress. Readers can reach Robbert on his personal blog at http://www.joomblocks.com.